Has Still Game unwittingly started a new trend? After the Kiernan and Hemphill show made a highly successful transition from small screen to the large stage of the SSE Hydro last autumn, Iain Connell and Robert Florence have followed suit by bringing their cult Comedy Unit sketch affair, Burnistoun, to the Glasgow International Comedy Festival. Kicking off in 2009, Burnistoun lasted three BBC series, and with Connell and Florence creating new show The Sunny (a pilot episode was broadcast last October), it may have seemed that the pair had moved on. But when tickets for their GICF show sold out in less than an hour, it might have dawned on them that there could be more life in the likes of Jolly Boy John (For Real! 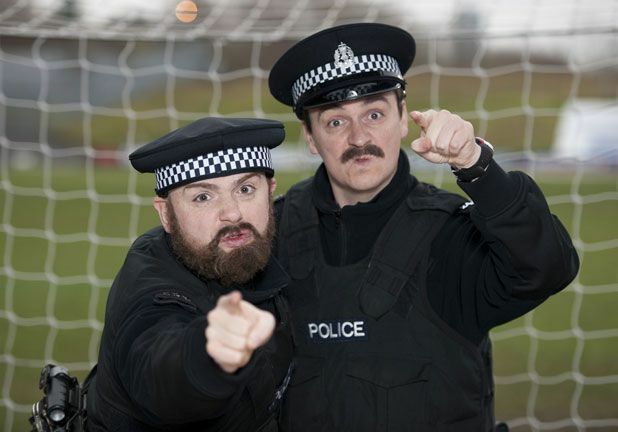 ), the Quality Polis McGregor and Toshan, ice-cream men Paul and Walter (allegedly killed off, but perhaps given a posthumous tribute here), and those stubborn voice-recognition lifts that can’t quite penetrate the Scottish accent (everyone shout ‘elivin’ on cue). And so the really good news for those who weren’t quick enough to snap up a seat for the King’s date is that Burnistoun might now take to the road and spread its wings to other parts of the country. And no, I’m not a member of Sarcasmaholics Anonymous. King’s Theatre, Glasgow, Wed 25 Mar. The whole gang heads to the city centre including McGregor and Toshan the quality polis, Jolly Boy John, deceased ice cream brothers Paul and Walter and even the stubborn voice recognition lift who doesn't understand Scottish. For Real.